YouTube down error messages are far from rare for those who watch YouTube videos a lot. According to figures, a good 40% YouTube videos will have problems of all kinds, like the most common an error occurred please try again later, no sound on YouTube, playback errors, 500 internal server error... I bet you can name a few. For those struggling with not working issues, here we have gathered the most cried YouTube errors together with useful tips on how to fix YouTube problems. There are forums providing help tips in an attempt to fix various kinds of YouTube playback errors. To help you fix any unexpected errors occurred on YouTube, we collect from types of support forums the errors on YouTube that cause the most user complaints and YouTube troubleshooting tips for each problem. 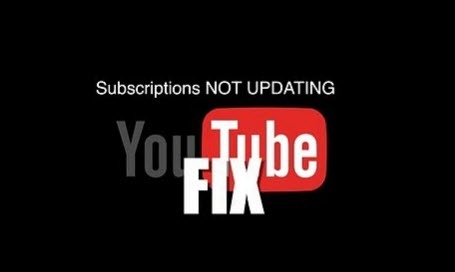 If your YouTube is not working, you can find a YouTube down fix below. ▶ Convert YouTube videos to mp4, mov, avi, mkv, 3gp, h264 200 more files for smooth playback. 1. Free download the YouTube issues fix downloader on Mac (or Windows version for PC) and launch it. 2. Copy and paste the URL of the video or music you'd like to download. Click "analyze" to load the video info. 3. Choose video format, mobile devices, resolution, file size. 4. Specify an output folder on your Mac to save the downloaded files. 5. Click "Download Now" to free download YouTube videos offline. Then you can play YouTube with no playback errors. Error screen or blank screen is among the most common YouTube not working errors. A quick search on the forum you can find many users are prevented from watching the videos by the dreaded message "an error occurred please try again later", or simply a blank screen. Fed up with this YouTube down issue? 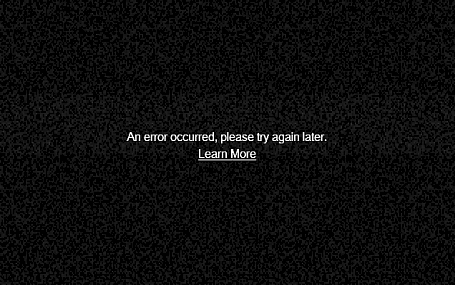 Let's check the an error occurred please try again later YouTube fixes. 1.As soon as the message appears, hit your backspace key, then go back to the video. 2.Reload the video later or immediately. 3.Update the Adobe Flash Player to the latest version. 4.Upgrade your browser. Did not work for me either as I'm always running the latest version. 5.Delete cache, cookies, history and temporary Internet files. 6.Change the video quality change all video resolutions 1080p/720p to accepted quality. 7.Disable or remove the addon 'Video DownloadHelper'. 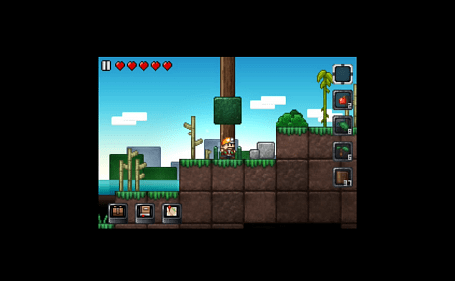 (Tools > Addons >Disable button or Remove). 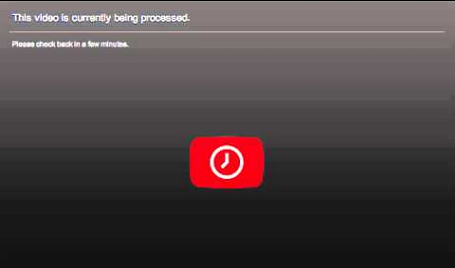 8.Disable Shockwave Flash player and use the HTML5 player in the meantime. 1. Check your settings to see if the feed goes into "most relevant", "New activity" or "a-z" modes. 2. Try signing out and signing back in. 3. Try clearing your browser's data, caches and cookies. Every once in a while, you may run into another error on YouTube: all the things run well but the audio. Videos play smoothly with no sound or horrible sound. Yeah, you get there with many other users who suffer from sound not working. How frustrating to have no sound in YouTube problem when you are enjoying music from Taylor Swift or Nicki Minaj. The tips below may help with error with audio. Have a try. 1. 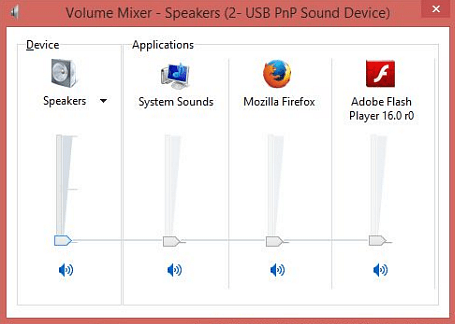 Check if you have turned up the volume of the Flash player after the latest update. 2. Install the latest version of the Flash plugin. Uninstall the adobe flash player if the above tips doesn't work. 3.Close any open multimedia and programs like any Messenger, music or video player, etc. 4.Clear all the Cookies, History and Temporary Internet Files to ensure that NOTHING is interfering with YouTube's settings. 5.Update your web browser to the latest version to check if it helps the playback sound not working error. 6.Disable the video accelerator of any kind. 1.Watch videos at a lower quality by changing the resolution. 2.Clear the browser' cache, cookies and history files. 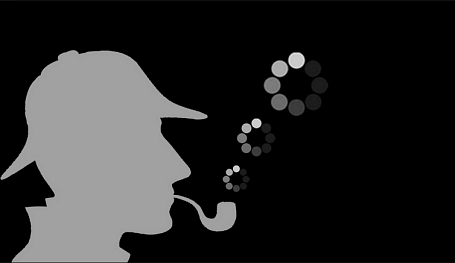 3.Close other internet activities that eat bandwidth. 5.Update your Adobe Flash Player to the latest as well as the most stable version. 6.Make sure your internet connection is at least 500 Kbps to avoid any loading issue. YouTube down with 500 internal server error is one of the annoying error message. 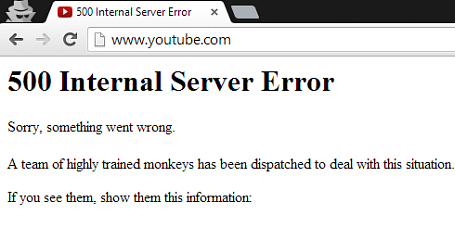 Unlike an error occurred YouTube, the 500 internal server error indicates that something has gone wrong on the web site's server. It's not clear what lead to this technical complicated problem, but there are few tips that may fix this YouTube not working error. 2.Clear browser's cache and cookies that may cause HTTP 500 issues. 3.Contacting the website directly is another option. Maybe the site's administrator have noticed the 500 error and you may ask them to help. 1.Reload the page or view the video later. 2.Update your browser to the latest version or switch to a different browser. 3.Clear your cache and cookies and history files. 4.Reboot your computer or view the video on another computer. 5.Use a different stable network. 6.The tips on an error and videos won't play above also apply. On the contrary to no sound where users can view the video without any audio, this time users can hear the sound but can see a green screen video only. This YouTube problem happens especially frequently on IE browser. So to switch your browser to others may be the first YouTube green screen fix. That YouTube down fix doen't work? Try other tips on how to fix the YouTube error. 1. Open Internet Explorer > Settings > Internet options > Advanced tab > Under Accelerated graphics select the Use software rendering instead of GPU rendering > Click OK/Apply. 2. Try disabling hardware acceleration. Right-click the Flash Player logo below, choose Settings. Deselect Enable Hardware Acceleration (on the Display tab), then and click Close. 3. Updating the computer's graphics driver. 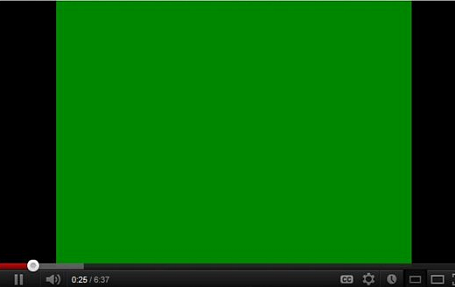 Similar to the YouTube green screen problem, users can sometimes run into down error with a black screen. If your YouTube video goes black, you may first of all try the tips to solve error of green screen, or check the fixes to black screen problem on YouTube. 1.Uninstall and Reinstall Adobe Flash Player. 2.Reset Safari, Firefox, Chrome and clear cache. 3.Launch Safari, Firefox, Chrome in 32-bit mode. 5.Opt out of HTML 5 settings. Some users encounter YouTube not working on iPad problem like the "cannot connect to YouTube", Youtube app not working "error tap to retry" etc. This is mainly because that the site stops support the older version of iPad and Apple TV. But users are not necessarily to buy the latest iOS devices. 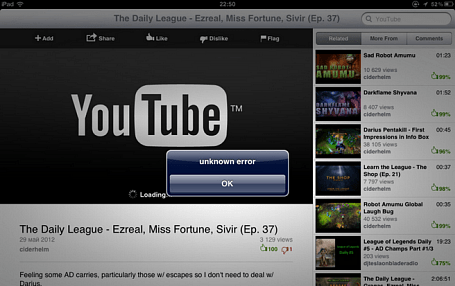 How to fix YouTube errors not working on iPad Apple TV of old version? 2.Reset iPad to factory defaults. 4.Update YouTube app to the latest version. An error stating that the video is not available in your country. This issue is caused by two reasons: the video content is limited to certain countries only, or the video is blocked in accordance with the local laws. If so, you can rely on vpn or proxies. If all videos are saying not available in my country, that's propably temporary YouTube down bug and you can wait for YouTube to fix it. Except all the playback errors on Mac/PC, iPad Apple TV mobiles above, some percentage of the cried errors involve video uploading. The upload problems are reported to include file being rejected, error reading the file, video getting stuck at 0% or YouTube error message stating that "We have encountered unexpected problems". 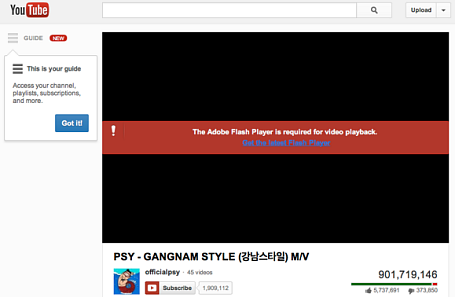 In this case, the chances are good that your video is not accepted by YouTube. 1.Check your browser and try different web browsers (Google Chrome, Firefox, Internet Explorer, or Safari). 2.Update Adobe Flash player to the latest version. 4.Clear cache and cookies, history files. 1.Manually lowering the video quality may help to solve playing errors or streaming issues. 2.Retry playback or restart the video. 3.Force the app to close or restart your device. 4.Check for the latest system updates. The above are all the frequently asked problems. If you have any other errors playing videos but don't know how to fix those errors and problems, or the above YouTube not working fixes do not work for you, you are strongly suggested to free download the YouTube videos, music, movies etc with the online video downloader to get rid of any unkown confusing errors. Besides, it's also an expert in converting the downloaded YouTube videos music to various common formats and popular mobiles. Hope the above fixes help!